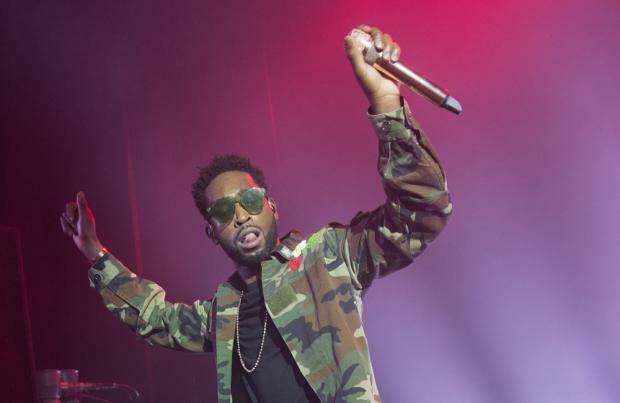 Tinie Tempah's first ever raps were recorded on a £20 microphone from PC World. The 'Pass Out' hitmaker has opened up about his humble start in life and how he has had to graft his way to becoming a star, which is something he has put across in his forthcoming LP 'Youth', which is packed with songs about his "emotional" journey to the top. He revealed how the cheap recording device from the British computer store was the only thing he could afford to make music. He said: "A lot of people see it [his career] as glitz and glamour but this has by no means been easy at all. I grew up in Peckham, I got a £20 microphone from PC World and started recording my first raps when I was 12 or 13. "We didn't really have anything there weren't that many prospects or hopes. "There were hardly any British rappers we could look at. I've put in a lot of graft." One way Tinie got inspiration for his first record in four years - the follow-up to 2013's 'Demonstration' - was by allowing strangers to use his studio in Greenwich, London. The 28-year-old rapper's record is full of collaborations with people as a result of making his studio an open house for artists at all levels. He told the Metro newspaper: "One of the first things I did was to open my studio and let all sorts of different people come in - not necessarily to be connected to be me but just to use it. As a result you have that awkward encounter, you go and make tea and, before you know it, you're talking to someone you probably wouldn't have otherwise." Now Tinie lives in an East London home that once belonged to the late fashion designer Alexander McQueen - who died in 2010 - which is full of stuffed animals, which he recently said helped with his creativity for 'Youth'. He said: "The giraffe was already there, but I bought a zebra, which is my favourite animal, so that the giraffe could have a friend in the house. "I'm not going to lie because I get some weird vibes in there, but it's positive and I think it's added and contributed to my creativity."